Thought I would give a bit of a review of a product I’ve used quite a few times and have found is perfect for those lazy weeknights when you want to use up what ever you have in the fridge. Some nights even the thought of getting a bag of flour out the cupboard is too much so these are really good to have on stand-by as they are quite long dated (26th Oct use by on mine). 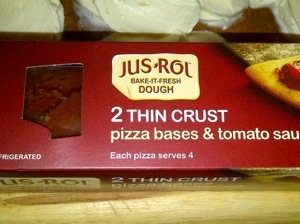 Each pack comes with two rectangular sheets of pizza dough and a jar of tomato sauce. I always put the dough onto a sheet of grease proof paper before I add the topping (found this out the hard way!). I found turning the edges up slightly gives a nice crispy crust too. The base is thin enough to get crispy in about 10-12 minutes. 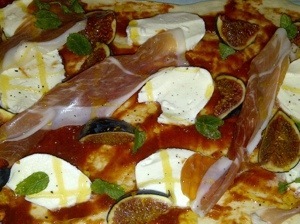 Today my topping of choice was fig, parma ham, mozzarella with a drizzle of honey and scattering of fresh mint!